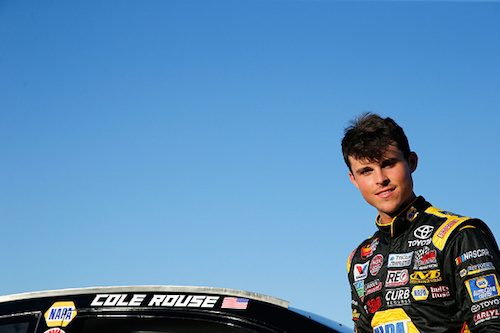 Cole Rouse plans to make his NASCAR Xfinity Series debut Saturday at Las Vegas Motor Speedway in the DC Solar 300. He’ll be behind the wheel of the No. 78 B.J. McLeod Motorsports Chevrolet. Rouse is the reigning CARS Tour Super Late Model champion. This year, he has been racing in the NASCAR K&N Pro Series East and West. He has six-career starts in the East division, all coming this year and resulting in best finishes of second in New Smyrna, Fla., and at Gateway Motorsports Park in Madison, Ill. He has been racing full-time in the West division this season, and also in 2016. In 24 West starts, he has nine top-fives, including two runner-up finishes this season at Evergreen Speedway in Monroe, Wash., and at Gateway. Rouse made two starts in the ARCA Racing Series in 2017, with a best finish of 11th at Kentucky Speedway in Sparta.